If property is all about location, location, location, business is all about leadership, leadership, leadership – so when I got the opportunity to spend time with fighter pilots at RAF Lossiemouth I expected to hear a lot about the role of leadership, split-second decision-making and mental toughness. Actually, what I discovered was that the best performing teams in the world rely on one thing for their excellence. The exceptional skills that allow them to deliver are based on each member of the team being able to give, and receive, effective feedback. In one way it’s no surprise. Nearly two decades in financial services before a career change into business coaching and training has shown me that transferable skills are highly prized. The very abilities I urge people to acquire for business success are almost identical to those most valued by the men and women who fly into hazardous situations on a daily basis. What works for Top Guns? In the fighter squadrons, de-briefs are often longer than the flight mission that preceded them and are highly valued. In the business sector we take five minutes, if that, to post mortem events and, unlike the RAF, it’s rare for significant change to result from a business post mortem. Sharing mistakes, openly and freely, ensures that lessons are learned throughout the RAF. A genuine ‘no blame’ culture requires both honesty and effective communication. As one pilot explained, “If I covered up a mistake which was later repeated and cost lives, I could never forgive myself”. In the city it’s much more common for blame to be apportioned than lessons to be learned. As a result, people keep their heads down and try to hide their problems so they can solve them alone, with consequences ranging from personal disaster to industry-wide catastrophe. Framing feedback in terms of how it made the recipient feel is vital. For example, “When you spoke that way during the mission it made me feel anxious” was cited as a practical example of how to build team performance, because if individuals don’t know how their actions affect others, they can’t change. Learning from the feedback to change what happens next. If training at this level appeals to you, or if you believe your business could benefit from learning the techniques described here, contact me and let’s explore how we can bring top gun training to your business. Katherine, I liked the post. 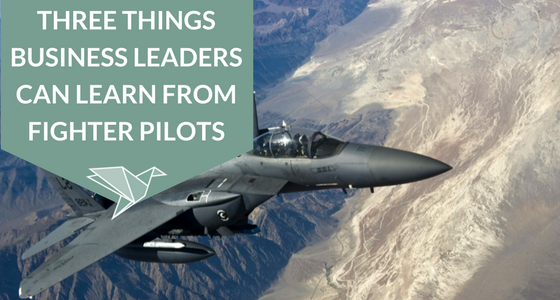 Especially, the part about how fighter pilots admit their mistakes to their peers. If only we could bring that into the workplace on a regular basis. Katherine, this is one goes into my ‘most powerful articles’ file. Short, concise and filled with impact. My take home? Take time to debrief. I think it will make me a better person and a better leader. Thank you for allowing me to experience this. Great article would love to implement this within my team and wider department. Feeling able to admit mistakes or oversights without the fear of blame is such a simple concept – but the modern workplace doesn’t accommodate it. Will let you know how I get on! This is so true ! It keeps froward communication from occuring , instead of realizing what prompted a comment , it keeps the whole conversation stuck in the muck.